Hirosumi Yamaguchi from Japan’s premier television channel NHK joined the Fishsiam team for a one week Thailand stingray fishing expedition in search of Giant freshwater stingray. On arrival at the Maeklong River the team was joined by Dr.Zeb Hogan from the National Geographic society for the one week production. After quickly positioning the rods the Japanese reporter soon got down to business as the team was soon attached to a Giant freshwater stingray. A thirty minute battle followed which saw the Giant freshwater stingray going to ground on several occasions deeply embedding itself in the muddy riverbed. After applying maximum pressure from above the fish was prized from the sanctuary of the riverbed and cranked up towards the surface. Moments later a large Giant freshwater stingray was brought over the waiting net. The stingray was transported to the riverside where it was observed to be a large female. The stingray was estimated to weigh 100kg’s+ and was examined by Dr.Zeb Hogan who fitted acoustic and external tags to the fish. Dr.Hogan was joined by Thai veterinary experts who assisted in all scientific procedures. The large freshwater stingray was observed to be a female and found to be in immaculate condition. The stingray was quickly released after photography and swam away strongly. All events were filmed by Hirosumi Yamaguchi in preparation for a forthcoming television production in Japan. The second tide saw the team once again fishing on a large bend of the river in search of more Giant freshwater stingray. An hour later saw a high speed take on one of the rods fished in the main channel of the river. On winding down into the fish the rod hooped over as another freshwater stingray moved off with the bait. Constant pressure applied from above saw the stingray quickly brought up off the bottom and fought out in open water. Ten minutes after the initial take a small male Giant freshwater stingray was brought over the waiting net. 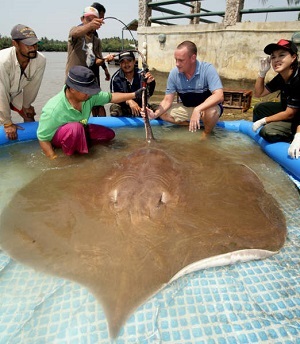 After moving the stingray to the riverside it was identified as being a small male of an estimated 60kg. Dr.Zeb Hogan carried out a scientific examination before fitting acoustic and external tags to the fish.